Kalley's Machine Won Some Awards! Kalley’s Machine Plus Cats had a whole bucket full of love poured on top of her interactive little head this past December. Our app was like a sweaty little kid in the backyard on a really hot summer day, and then Jinny Gudmundsen, Rob Ford, Jennie B and some wonderful person named Kirkus Reviews turned on the sprinkler. Jinny Gudmundsen is the author of iPad Apps for Kids For Dummies, and the editor of the famous website Tech with Kids, which declared Kalley’s Machine one of the 20 Best Kids Apps of 2014!!! Jinny is a nationally recognized expert on Kids Tech, and writes on that subject for a little newspaper called USA Today, which you may never have heard of but which we were PRETTY STOKED to be mentioned in, people! Well, and not only that. Jinny Gudmundsen also named Kalley’s Machine one of USA Today’s 10 Top Kids Apps of 2014! I already tried to make it clear to you people that Jinny knows way more about this stuff than you do, so if you’re about to say something like “well, what does she know? then just remember what I told you. She’s the expert, not you. OK. Here’s a fun little exercise. Go get like five books off of your bookcase. I’m doing it, too. I will be right back. Ok I’m back, and I only got two. Both of my books here have a list of people in the front few pages who have read them, and who said nice things about them. They’re called “reviewers”. Now take your books and look at the front of them. I bet one of those guys who reviewed your book is named “Kirkus”. And I bet that guy wrote the very most awesome stuff in that whole list, right? 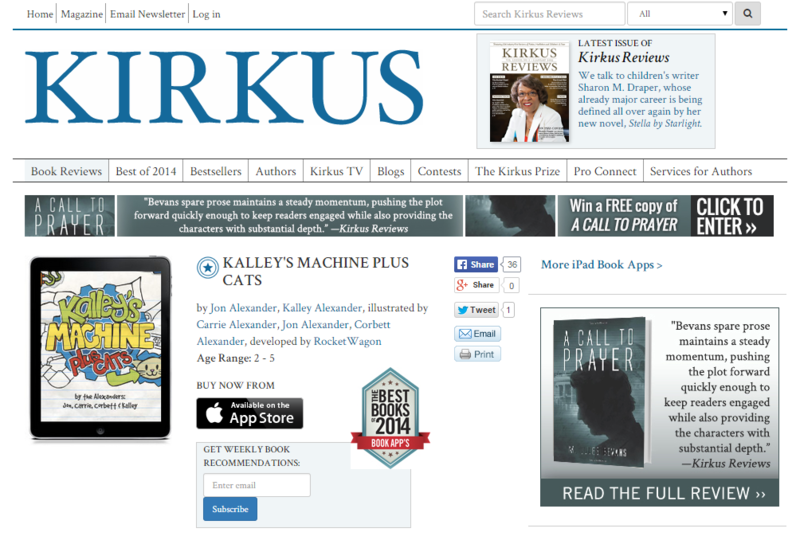 Well, that same guy Kirkus totally reviewed Kalley’s Machine and he gave it a STAR!!! Do you even have any idea what that means?! Have you ever even heard of a KIRKUS STAR?!! Probably not, because you never won one!! AND our new friend Kirkus (we here at Rocketwagon like to call him “Kirk” for short) also put us on this list he makes every year called Best Book Apps of 2014 ! Kalley’s Machine Plus Cats also won an mFWA Award. Don’t know what that is? I didn’t either. But my husband does. Jon says it’s pretty much the hugest honor you can get in the interactive agency world. And he’s flipping out about that one. Kalley’s Machine is also a finalist for a ‘Cybils Award’, which aims to recognize children’s and young adult authors and illustrators whose work “combines the highest literary merit and popular appeal”. FOR SERIOUS!! Highest literary merit and popular appeal!! I am not making this stuff up!! You totally thought I was and you were SO WRONG!! We have the mysterious “Jennie B” to thank for our Cybils nomination. We think we know who our secret benefactress is, but I do believe that I am supposed to keep my mouth shut about that and so I will. So there you go, this is my update. And before you PM me so as to gently explain that “Kirkus” is not really that guy’s first name, I will just let you in on the little secret that I already know that. I think I may have been in the house too long recently.